Hiking is an incredibly popular outdoor pursuit across the USA. It’s a wonderful way to experience the beautiful landscape, unplug from the hectic and fast-paced modern world and enjoy the benefits of rigorous exercise in the fresh, clean air of the great outdoors. As wonderful as hiking is, it’s important to remember that it can also present dangers, particularly if you’re on a long hike and in an area that’s a long way from assistance. Having the right equipment is vital, and when it comes to hiking, the most important equipment of all are your feet. In a survey of hikers who were injured while traversing through the Pacific Crest Trail, almost half of them reported that their feet were the part of the body that was injured. Feet are clearly vulnerable to injury during hiking trips, and looking after them should be a top priority. Foot issues can at the very least make a hike unenjoyable and uncomfortable and at worst, put you in situations that could jeopardize both your safety and your life. 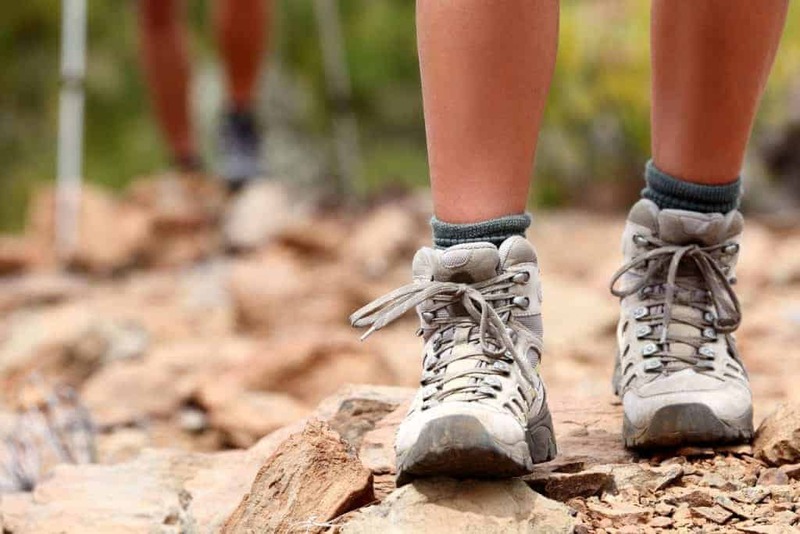 Here are two vital areas regarding feet safety that you need to address before you set out on a long-distance hiking trip. Blisters may not sound like a serious concern, but these common foot ailments are seriously bad news during a long-distance hike. What may start off as a small patch of chafed skin may soon turn into a raw open wound that makes every step you take feel like agony. Blisters can also become infected very rapidly, which is also bad news if you are miles away from medical aid. The two key contributors to blister formation are friction and moisture. Waterproof hiking boots that fit you properly will help to reduce the likelihood of blisters. Also, high-performance outdoor socks that are designed to wick away moisture from sweat and create a frictionless barrier between your feet and your boots are vital. Even with the right boots and socks, never assume that blisters won’t be an issue for you while hiking. Carry a well-stocked first aid kit that has blister tape, antiseptic lotion and antiseptic powder. This way, if any blisters begin to develop, you can treat them before they become a problem that will ruin or end your hiking trip. Having the right protective clothing may seem like a no-brainer when it comes to long-distance hiking. No serious hiker would set off without warm, waterproof clothing that is designed to maintain your core body temperature in cold or very cold winter conditions. However, you may not be aware of the important role your feet play in keeping your body warm while hiking. Firstly, your feet act as temperature regulators for your body. Their relatively large surface area, lack of hair, and small muscle mass mean that they effectively expel heat from the body. This quality is great if you’re in a hot environment but not such good news if you’re struggling to stay warm in freezing hiking conditions. Clearly, keeping your feet warm is important, and the right boots and socks are the best way to do this. Hi-tech socks which include merino wool are a natural insulator, which helps to keep your feet warm when they’re cold and cool when they’re hot and also allow your feet to breathe. This prevents your feet from sweating. Keeping your feet dry, whether from sweat or from external sources, is another key part in keeping both your feet and the rest of your body at a stable temperature. Heat loss from the skin, known as conductive heat loss, is five times higher if your skin is exposed to moisture than if it’s covered by a dry surface. This is another excellent reason to invest in waterproof boots and good-quality hiking socks. Even with a great pair of boots, always take a few spare pairs of socks along with you so that you can swiftly put on a clean, dry pair if the ones you’re wearing become wet. There is a Jamaican proverb that states, “Tired feet always say that the path is long.” This proverb seems apt when it comes to long-distance hikes and the role that comfortable, healthy and well-protected feet play in making your trip successful and enjoyable. If you’re looking for the perfect socks to team up with your hiking boots, then the VO2FX® Predator high-performance outdoor compression socks by SmoothToe will make the perfect addition to your hiking gear. With merino wool fibers weaved throughout the fabric and a blister-free guarantee, these socks will help to keep your feet in top condition on long hikes and any kind of weather conditions. The graduated compression technology will also keep your feet energized, supported and improve your blood circulation, all of which will contribute to a safer and more enjoyable hiking experience.